The second release in the hit Meisho series from Tamashii Nations reimagines Marvel's iconic superhero, Iron Man! 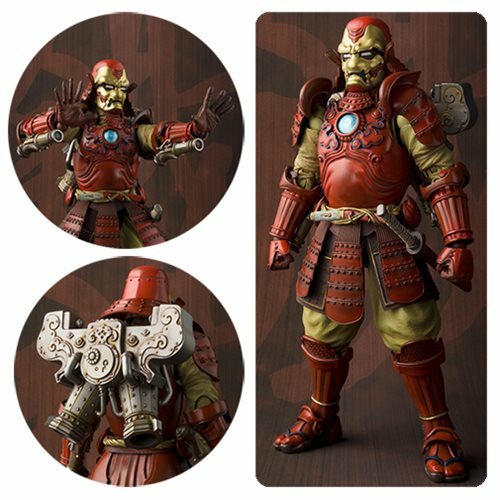 The Samurai Iron Man Mark 3 Meisho Manga Realization Action Figure, as envisioned by the talented Takayuki Takeya, features Iron Man's high-tech armor rendered as ancient samurai armor, with details down to the ornate scroll-work on the breastplate and rivets on the plating. Clockwork, steam-punk style jetpack and flintlock rifle-esque cannons enhance the fantastic atmosphere of the design. The Samurai Iron Man Mark 3 Meisho Manga Realization Action Figure stands approximately 7-Inches tall and comes with two types of optional hands (left and right sides), a katana, and a jetpack. Ages 15 and up.